Inspired by the beautiful history of the Mediterranean, the Montebella collection by Bernhardt features a distinct style with graceful curves and intricate attention to details. Offering a look that's different than anything else at Belfort Furniture, this collection is versatile and can fit into different design styles with the right accessorizing and architecture. With a rich auburn finish, the Montebella Collection can prove to fit right in with a mountain lodge inspired home with a rustic style or into a suburban home with a traditional style. Truly a collection that brings rustic elegance to your home, Montebella features tough rooted traditional European design and elegant accents like seeded glass and decorative wood grilles. The designers hoped to capture the rolling hills of the Mediterranean countryside with this collection whose name means 'beautiful mountain'. Create your own version of a Mediterranean Villa right at home with this new furniture collection by Bernhardt. Sculptured moldings add beautiful texture to the graceful sleigh bed. 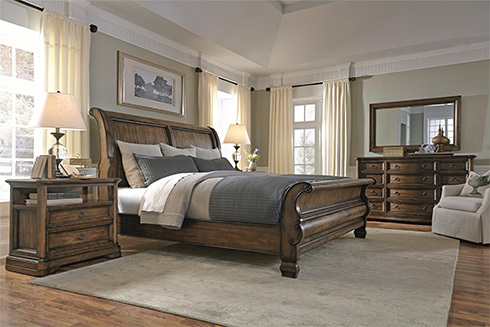 A strong arch in both the headboard and footboard provides a statement look. Elegant shaping and quality craftsmanship are evident with this beautiful bedroom. The traditional dining room setting with room to fit 8 chairs is set in a sophisticated style and grand scale. At the dining table top is intricate detailing with the veneer wood work to create an inlaid diamond design. The stacked, turned legs resemble classic Italian columns. 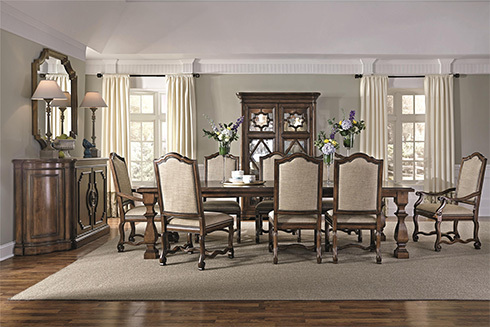 With Montebella's gathering height dining set, the table takes center stage. You can't miss the beautiful decorative metal panels in a traditional influenced scroll design. Detailed designs adorn the table's top again with the veneer wood work. Montebella's accent pieces throughout the collection feature intricate detailing to grab your attention and capture your eye. This dining buffet looks great paired with the detailed wood frame mirror hung either horizontally or vertically! To view this beautiful collection's details in person, visit Belfort Furniture's Galleries Showroom - building #1 in our Dulles, Virginia furniture campus. The Montebella collection is on display, along with hundreds of room settings. You're sure to find some design inspiration and ideas for your own home after walking through our showrooms.